Garage: "Driveway, Paved or Surfaced"
All Towns Aren’t Created Equal.In fact, most towns aren’t created at all. They just happen. The decade of careful planning that preceded the first turn of a shovel at Babcock Ranch is just one of the countless ways Babcock Ranch sets itself apart. With a seamless melding of modern technology and timeless hometown charm – all nestled within expansive natural spaces – the world’s first solar-powered town provides a whole new way of life. This NEVER LIVED IN Sylvester floor plan in Trails Edge is ready for you now. 3 bed/3 bath/den/2 car garage/open floorplan with stainless steel appliances, tankless hot water heater/crown molding and granite counter tops. Why wait 6-12 months to build when you can move right into this one for less than the builder is now selling the same floor plan for? 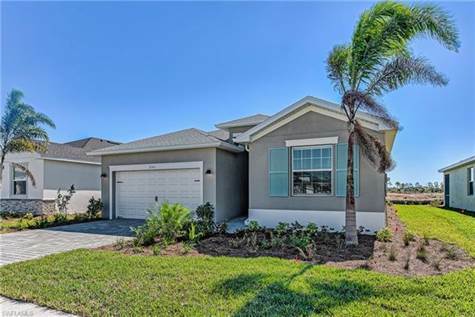 Sit out on your covered lanai and watch the amazing SWFL sunrise, or take a look out front in the evening for a colorful sunset, with this home you get the best of both. Make this your dream home today!